Great cooking can be compared to golfing. If you have ever played golf, and your head was somewhere else or thinking about work or that person that ran you off the road, you will undoubtedly not fare well in the end game. For those that know me, know I’m a juggernaut in the kitchen. I simply love cooking. From afar it probably looks comical or otherwise animated like a silent symphony of random actions with colliding aromas. In my head, it’s a final picture and I can see it clearly with every meaningful stroke. For me, it’s about the challenge of cooking something that I’ve never made before and the gratification when it actually results in something delectable and unique that others enjoy. But most always, it starts with a plan and the fortitude to adjust in real-time while staying focused on the end game. For this recipe, it was simple – make something for the first time and make it memorable. 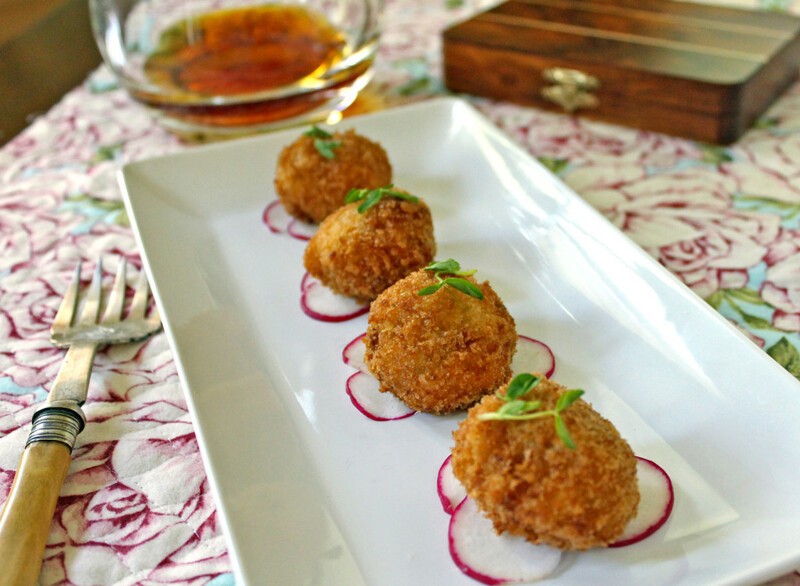 These croquetas are delicate and exceptional – all the right balances of flavors and textures. In the immortal words of Julia Child – “If you’re afraid of butter, use cream.” So too holds true in frying versus baking. Truth be told, I made this recipe both ways (baked and fried), and simply put – a little evil is good from time to time, and the unmistakable crispiness from the fryer provided the right balance to the creamy inside of this croquetas. I suppose the next time I play golf, I will endeavor to think of nothing else but this dish and the end results. TIP: Can actually freeze these after frying, and reheat in oven at 425°F for 10 min. In a sauce pan over medium heat, add milk and bay leaf to warm and flavor the milk). In a separate sauce pan over medium-high heat, warm oil and add onion. Cook for 5 minutes. Add butter to onions. When butter is melted, stir in flour and cook 3 minutes stirring often. Remove and discard bay leaf from milk, then whisk warmed milk in with onion mixture. Cook, stirring often until the sauce thickens, 5 to 7 minutes. Season with salt, pepper, and paprika. Remove from heat and stir in cheese, ham, and parsley. Spread the mixture evenly into a glass dish, cover tightly with plastic wrap, and refrigerate for at least 6 hours. Place beaten eggs in one dish, and bread crumbs in another. Using two spoons, form the chilled mixture into tapas sixed balls or cylinders by scraping and shaping the mixture into each spoon (quenelle). Roll each croquetas first in bread crumbs (pressing and shaping gently), then in beaten egg, then in bread crumbs again. Fry croquetas, a few at a time so not to crowd and stick, until golden about 1.5 minutes. Serve hot. This entry was posted in Appetizers, Cooking, Sides, Summer and tagged Spanish, Tapas by cfaust. Bookmark the permalink.